Here, we have some convincing evidence that this particular bottle was a southern product. 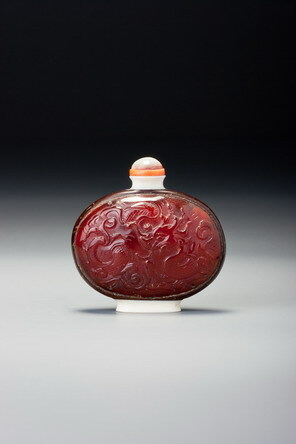 The style of carving of the dragon on the amber panel is typical of Guangdong style as found on a well-known series of inkstones carved in Guangdong province, where the stone itself was found. (They are of Duan stone from Duanzhou; see Moss, Graham, and Tsang 1993, nos. 84 and 85, for further information, and Treasury 3, nos. 393 and 394, for two examples with related dragons and clouds.) The design here, with the dragon shown partly obscured by formalized clouds and with paw-like feet rather than the eagle-like claws of its typical northern counterpart, is typical of Duan-stone wares carved in the south. We are encouraged in this attribution by lot 160 in this sale, which combines two of the present materials, coconut shell and ivory, with panels of typically Guangzhou-style decoration. 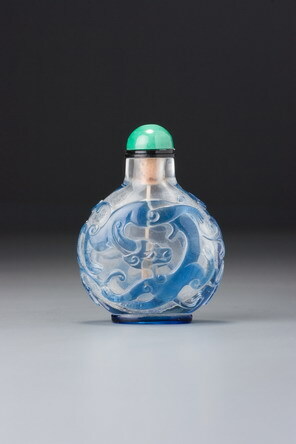 This combination of the three materials is a rare one for snuff bottles, or indeed for any other works of art.